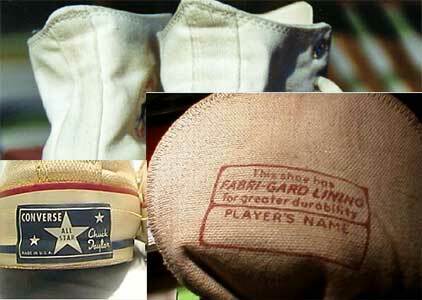 White Converse All Star High Tops in the 1960’s, “the Cadillac of gym shoes”, featured a blue heel patch and a brown name label in the tongue. They aren’t much to look at now — the old pair of high topped Converse All Star white canvas gym shoes that snuggle timidly against each other in the corner of my closet. But they still look great to me. I felt my feet smiling when they walked past the discarded shoes at a garage sale back in the summer, so I bought them for $2 and for old time’s sake. These shoes could pass for twins of the pair that ran me through high school back in the 1960s. Converse All Star Chuck Taylor models were the Cadillacs of gym shoes in those days — $8.95 a pair, and generally available only to basketball teams. Otherwise. I would never have considered trying out for basketball. I liked the game just fine and played almost all year on dirt and asphalt courts around home. But I wasn’t much good on a gym floor with some one guarding me, and my stocky frame always felt more comfortable in football pads. Yet I loved Converse All Star Chuck Taylors so much that it made me crazy when the basketball players came strolling by in their new $8.95 shoes. So I signed up for the team and got ready to run my short legs off, if necessary, to get my feet into a pair. Many other boys apparently had the same idea, because a small army showed up to begin several weeks of fall practice after which the varsity team would be chosen. That first day, we ran wind sprints and shot laps, then ran laps around the gym — up to the tops of the bleachers on each side and back down again, and up and back for a long, long time. We kept running for weeks, until we were no longer boys but just pitiful blobs of sweat an danger, fatigue, soreness and muffled profanities. In time, many of the boys dropped out, but I did not. The lure of the shoes was too great. Finally, between fundamental drills, we started running plays and setting defenses. I pretended to be interested, but I was really dreaming of replacing my old worn-out pair of black U.S. Keds with a brand-new pair of white Converse All Stars with Chuck Taylor’s autograph on the seal. I didn’t know who Chuck Taylor was but learned years later that he was a guy who may have played semi-pro basketball and whom Converse hired in the late 1920s to organize kids’ basketball camps for the purpose of selling gym shoes. Finally the day came when the coaches asked our shoe sizes and told us to bring our $8.95 to the next practice. Several days later, when practice was over, the coach whistled us all together, thanked us for our hard work, passed out our new white canvas Converse All Star Chuck Taylors and told us he had posted the names of those who ad made the varsity team on the wall at the end of the gym. We crowded around the list, shoving and yelling to see who would dress for the Wildcats that season. What a surprise to see my name wedged between the boy who stood 6 feet 4 and one who was 6-2. I sat down on the bleachers, removed my brand-new white canvas Converse All Star Chuck Taylors from the box, smelled them, laced them up, slipped them on and bounced up and down on the hardwood a few times just to see if they worked. Then I found a pencil, marked my name off the roster and left practice for the last time.